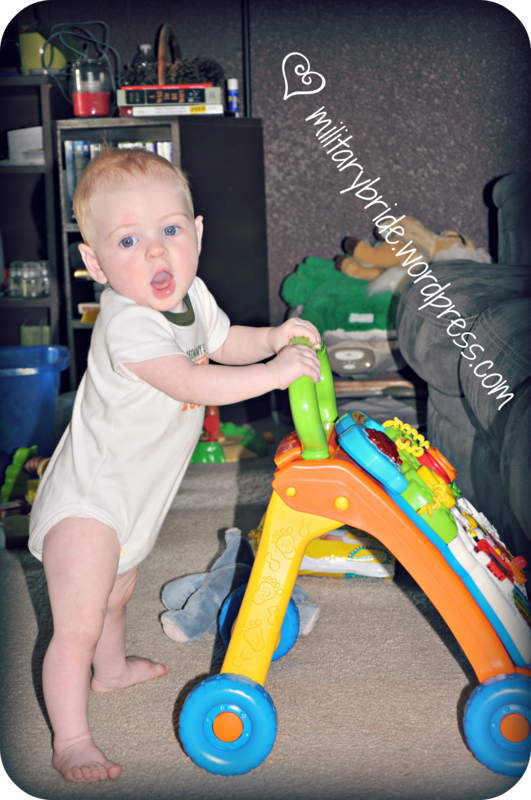 Seven Months Walking? I’m screwed…. I’ve been trying to write for the last twenty minutes. My little blue eyes has been crawling on my back and grabbing fistfuls of hair. I love him being mobile, but it’s coming way to quickly. He’s been walking back and forth with his little walking toy. I’m so sad. He’s growing up so quickly. Seven month olds are not supposed to be pushing toys back and forth. The days I go to school are a little hard. I’m at school all day, and I don’t get home until an hour before bedtime. I’m afraid I spoil our little boy a little. I can’t help it when I only see him for an hour. We’ve been starting story time. He’s really starting to like books. Of course he wants to eat the pages. :0) To him everything is food. If you haven’t had a chance yet, I’d love for you all to vote for my little man in the gerber contest. I get told all the time that he’s the perfect gerber baby, and I’d like to see how well he does. If you don’t have a chance, it’s fine by me. I had a really great topic today, but I can’t seem to remember what it is. That’s how it always seems to happen. Mr. Blue Eyes had to be put to bed, and his bottle spilled down the front of my tshirt. Then the puppies had to be let out and it seems like there is always something that needs done. But I love to write. I love the feeling of sitting down for five or ten minutes and knowing that I can get out what my day has been like. So the important post will have to wait for tomorrow. Have a safe evening everyone! Posted in Baby, boys, dogs, family, hubby, humor, husband, life, Life Lessons, military, military family, milspouse, mommy, navy, Parenting, photo, photography, Uncategorized, veteran, wife and tagged babies, baby, baby boy, boys, child, children, family, gerber, hubby, husband, kids, life, milhubby, military, military baby, military family, military life, military wife, milspouse, mommy, parents, people, pets, photography, son, spouse, walking, wife. Bookmark the permalink. You can’t spoil a baby!! 🙂 You just can’t. Babies were made for “spoiling.” Just give him all your hugs and kisses at every chance. He really knows you love him. You’re a great mom. Enjoy every moment, because you’ll miss this. I love that little guy! He is definitely strong. He’s been trying to be on the go since he was born.